Learn 200 Words a Day - Learn French the easy way. with your French language course? incorporating memory techniques. You can easily achieve this. (which sounds like LA FISH). Imagine a mermaid putting up a poster of a FISH. Learn French with pictures for easy memorisation and accelerated learning. Poster in French is l'affiche, which sounds like LA FISH. With pictures and Memory Triggers like this French learning is made super simple. What is more you will REMEMBER what you learned! Learn French vocab easily like this. We can make learning French fun. What's more - things, or nouns, in French are either 'male' or 'female' - which stumps French learners (because they can never remember which is which!). But with the powerful tool of a Memory Trigger picture in your hands - it is easy - a unique female character (in this case, the mermaid) is used with each feminine word, and unique male characters for masculine words. [Yes a different one with each word so that you remember the word and its gender with the picture]. It's all in the Memory Trigger picture, that snapshots itself into your brain's subconscious. The world's great Memory Masters, people who can memorize several decks of cards, lists of thousands of items etc, teach us that to imbed something in your mind so that you will remember it, you just need to visualise it in a crazy scene in your mind's eye. You just shoot a funny, goofy mental movie. And it really works. I have done it - learnt the techniques to memorise decks of shuffled playing cards, and the value of 'pi' to dozens of decimal places but... SO WHAT?? ...using these same techniques you can memorise useful things like thousands of French words and phrases, at incredible speed, and with tremendously deep and effective recall. To shoot a mental movie takes time and effort. Yes, effort to concentrate. Ideally you need up to a good minute to thoroughly visualize something. • We take away the time factor by giving you the visualization in the form of a picture. A fun cartoon, like the ones on these pages. • You can see how you can rapidly learn French words by the hundred in very little time. Well we've done just that with our Learn French 200 Words a Day! CD-Rom courses. © exceltra. Learn French fast with the Memory Triggers and visualizations of the 200 Words a Day system. Try and forget this one. I will bet that you can't. • Around 40 French lessons per Course, and each is just 5 - 12 minutes, after which you can test your progress and see how quickly you are learning French words and grammar. • Watch your learning rate with pride! (... it is automatically calculated in words per day. If you are not pleasantly surprised how quickly you can learn French, you can get your money back! Superlearn French - it has never been easier to get a grasp of French words. • Each word is spoken by Native French Speakers giving you the correct pronunciation to hear and copy, as you learn French. My wife, two children and myself have truly found it a great help, and it has worked for us much more so than the many other products we have tried. Most enjoyable were the cartoon system and word associations. Everything was quite clear, unlike several other products we had tried, but had failed for us. • You never need forget another gender as you learn French! Looking at the picture above you can see that because the main character in the cartoon is female, you will know the word is feminine! • The best French course available giving you a fun, picture cartoon for every single French word and phrase in the 'Learn French 200 Words a Day!' course. This means you will remember the picture, so you can more easily remember the French word, given that 'a picture paints a thousand words...'. Remember - your brain never forgets a picture. When you get stuck for a French word, you just think of the picture and the memory hooks in the cartoon get the brain digging around, making remembering much easier. 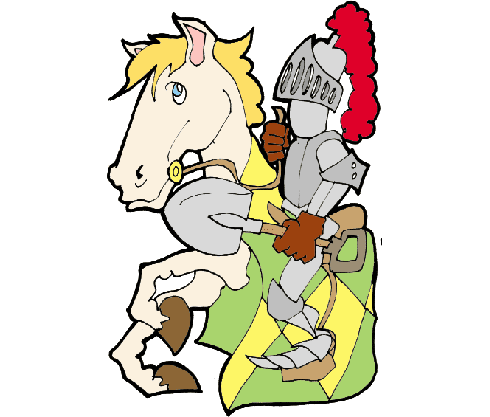 ... imagine a Knight on a horse with a SHOVEL. © exceltra Learn French - learning and remembering French words like 'cheval is made easy with the software and Memory Triggers of the 200 Words a Day! system. Each and every word has a unique Memory Trigger picture, and sound recordings of native French speakers so you learn from perfect pronunciation. You can see how easy it is to learn French at the rate of 200 words a day using these techniques. Of course, this is not imperative, you can learn at your own pace, a lesson a day if you like. I bet you will remember these for a long time yet. This system steps ahead of the rest for speedier and more effective French learning, giving you all the most common French words and phrases. Yes, on our rapid mode you can even have fifty to a hundred French words an hour being taught to you, which is ideal for previewing, revision and summarizing as you learn French with our French language CD-Roms. It was amazing to see how much and how quickly our children actually remembered the words taught! It never occurred to them that they were learning. And, of course we know learning is easier for young brains, however both my wife and myself found the system remarkably funny and hence, not a chore to-do’. The children really enjoyed the tests at the end of the sections. They often did these together and requested to ‘play’ it instead of their usual computer games. What a plus! I must admit I used the test solo for my private viewing only. I can only reiterate once again, many thanks! Sincerely, Paul Arshad, Lourquen, France. with 800 French words a person has the basics for basic, operational communication with a French language speaker, you can see what an effective language learning tool you will have in your hands. (Course 1 of Learn French 200 Words a Day! has all the 100 most common French words). With the 2,000 most important French words one will have a high degree of operational French understanding. (Course 2 is a further 1,000 French words). What’s else is hot about these learn French language courses that make them great for someone wanting to learn French?
. . . and they have many of the most modern memory enhancing and memory retention methods known. for you to learn in every French course. • fun, bright, fun, easy, colorful. Just relax and bring your sense of humor! with lots of useful functions to select from for accelerated French language learning. Learn French fast! and suitable for old and young, all ages. Each member of your family can learn French at his or her own pace. Each person's progress is individually recorded in their own private log. You can even have competitions with one another, to see who does learn French words fastest! Optimal learning involves reviewing your work. It is easy to forget about reviewing and re-studying, but not with our system. You will be prompted by the programme to review and re-test yourself a day after you complete any lesson, then again it reminds you to revise that lesson after a week, then after a month, then three months, then after a year. Continuously keeps you updated on your progress, keeping a record of all your scores, tests and learning times. These are all stored in your own database. Right click on the screen any time when you need assistance. Easy and convenient. • A range of up to 40 French lessons! Up to 30 words in each French lesson covering topics such as Food, Counting, French Greetings, the Months in French, weeks and days of the year in French, Family, Town, Travel, French Verbs, Common French Expressions and Home and lots more. Lessons are quick - only 5 minutes to 12 minutes each! •Blitz and bludgeon your worst words as you learn French! One of several special lessons that is compiled and created automatically, the programme targets those words with which you have the most difficulty! The French lesson is called 'My Worst Words'. This 30 word French lesson is one to constantly revisit as it allows you to focus on the your problem French words. The ones you get wrong the most often. And it is automatically updated at all times. The programme is constantly assessing your scores for each and every time you take a test on any word. The best and worst are ranked accordingly with your performance as you learn French vocabulary and phrases. • Great value for money! Over 1000 words in every course. Upgrades Course #1 with an additional 1,000 words. Continue building your French vocab and receive a complimentary 200 Words a Day! 101 French Proverbs Course! Traditional flashcard learning only better - with great photographic visuals as an alternative to learning, testing and revision. Switch between the two modes at whim. The Sentence Courses enhance the vocab-builder courses by offering a drill-down function – just click on the picture to hear and see the word in a sample sentence. Excellent for extension learning with even more new vocab and aural and spelling practice. Can also run as a separate course, with Lessons, Testing and Review Progress functions – and the drill-down will run vice-versa. I definitely didn't think I would be achieving 200 words a day. It seems far too many to remember , especially as a beginner to the language, but I am easily scoring 257 words a day on the Spanish. You have a no-risk 365 days to evaluate this course! Order the 200 Words a Day! system entirely at my risk. Let me lose my shirt rather than you lose yours. That is why your order comes with a 100% no-questions-asked One Year Money Back Guarantee. There is absolutely ZERO RISK for you. If it genuinely doesn't work for you, let us know why, and send it back for a refund of the price of these French language CD-Roms. You have a year to sample it, test-drive it, and use it (but don't abuse it!). Exceltra - French 200 Words a Day! to get your own 200 Words a Day! French Cours! Learn French - 200 Words a Day! 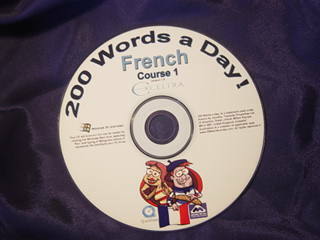 Turbo-boost your French learning with this CD-Rom course! Individual Memory Triggers© help you learn French words and French phrases quick, fast. Cartoon pictures for each and every word! including many animations. Test and retest your French vocabulary as you learn French. Your French Learning Rate measured on a words-a-day basis after each and every lesson and test. Blitz and bludgeon your Worst Words! Three Gender Triggers © for each and every word. Never forget a gender when you learn French. Native French speakers for perfect French pronunciation help you learn French. Easy and fun for 6 users - all with their own private notes and passwords. Fun for the whole household. 100 most common words used in 50% of French conversation. Lots of important common French phrases. Over 40 French lessons Food, Counting in French, Family, Town, Travel, learn French Verbs, Common French Expressions, Home and lots more. All learning styles for Multi-Modal French learning. Kinesthetic learning, Audio learning, Visual learning. Superlearning Music gets brainwaves to optimum learning state. Build your own French lessons too! Select signedfor Delivery option below if required. Our programmes are suitable for the following operating systems: Windows 7, Windows Vista, Windows XP, Windows 2000, Windows Millenium, and Windows 95.
require previously-installed PC Emulator software to run our programme. We recommend VM Fusion. We also accept most credit cards to process directly. Please phone +44 1908 676 873 U.K. or contact us by email. Cheques are accepted in the following currencies: US Dollars, UK Pound Sterling, Australian Dollars, New Zealand Dollars, Canadian Dollars, Euros. Converted at the prevailing rate from US Dollars. exceltra, Learn French 200 Words a Day, 32 Alverton, Great Linford, Milton Keynes, MK14 5EF, Buckinghamshire, England, United Kingdom. Your order will be processed immediately.